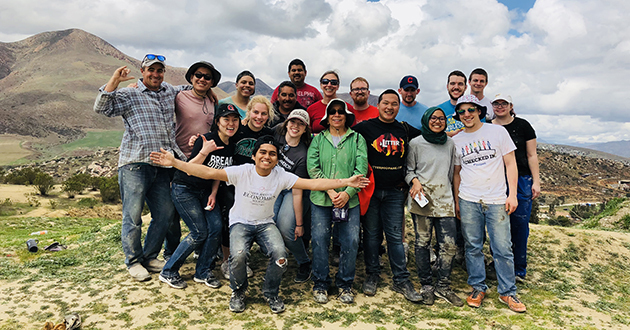 Fourteen students in the Economics of Immigration service-learning course traveled to Mexico over spring break, working with Esperanza International, a nonprofit community development organization, to help impoverished communities rebuild. The goal of the course is to give students a better understanding of how immigration affects different communities and to see how data look in a real-world setting. When some Ohio State students arrived in Mexico for spring break, they were met by sandy beaches, ocean waves and a week of relaxation. For others, such as the students in Darcy Hartman’s "Economics of Immigration" class, they rolled up their sleeves and got to work. The 14 students in Hartman’s service-learning course traveled to Tijuana, Mexico, a border city about 20 miles south of San Diego, to spend spring break working with impoverished families in the community. The group partnered with Esperanza International, a nonprofit community development organization. Before the students could get started, they had to make their own migration. They traveled from Columbus to San Diego and used public transportation to get to the border. From there, they walked from the United States into Mexico, where they were met by Esperanza International members. For Bethany Cady, a third-year economics major, the journey revealed the reality of Tijuana’s economic despair, but also displayed moments of beauty. The group was tasked with building the structure for a new kitchen on an existing home, as well as working on improving the infrastructure of a government-donated property. What was consistent across both worksites was the ability for the students and community members to work together, despite at times having an evident language barrier. Together, they moved dirt and cinder blocks, mixed concrete, tied rebar and completed many other tasks that come with construction. Many of the people that Esperanza International helps are individuals who have been deported from or want to immigrate to the United States. The students had the opportunity to meet with some of these people at Casa del Migrante, a shelter that provides migrants, deportees and refugees with food, shelter and other resources. Meade said the most memorable part of the trip for him was when the group was at Casa del Migrante and he met a 17-year-old boy who had attempted to cross the border in an effort to escape poverty. Hearing the boy’s story helped Meade see the importance of the service work they were doing in Tijuana. This year’s class was the third group that Hartman has taken to Tijuana since the course was established in 2013. Prior to 2014, the class focused on working with immigrants in the Columbus community through Tewahedo Ethiopian Social Services. Once the study abroad component was approved, the course incorporated the trip to Tijuana, while also keeping a local component. This past semester, students helped to manage the finances of a Columbus-based family facing deportation. The goal of the course is and has been to give students a better understanding of how immigration affects different communities. Umar Shafiq Bin Hisham, a fourth-year economics major, has witnessed his fair share of the effects of immigration while in his home country of Malaysia. Another major takeaway from the experience was students being able to see how data were fleshed out in a real-world setting. While you can see numbers reflected in rates of homelessness and housing quality, you can’t see how owning a home enables people to have an increased quality of life, Cady explained. Through their experiences, the students were able to see how the numbers shape people’s lives.